Fire pits make great additions to any outdoor space and instantly increase visual appeal. We don’t recommend placing a Fire Pit Gallery fire pit on a wooden surface, such as a deck or patio, because you run the risk of damaging that surface. However, if you do choose to place your fire pit on a wooden surface, take these measures to protect that space. You may have picked the perfect spot for your fire pit, but you should also make sure that it’s strong enough to hold up. Steel fire pits can be quite heavy and to decrease the risk of them falling through or damaging your wooden surface, make sure it’s strong enough to hold a weight greater than the combination weight of your fire pit, any additional furniture on your patio and the estimated weight of multiple people. No matter if you place your fire pit on land or a wooden surface, make sure the space around it is clear. Try not to put potted plants or flammable furnishings near your fire pit. Also avoid setting your fire pit into an area that easily fills with dead leaves in case embers fly from it. If you’re looking for a fire pit that doesn’t produce embers, consider one with a LPG (liquefied petroleum gas) or NG (natural gas) fuel source. 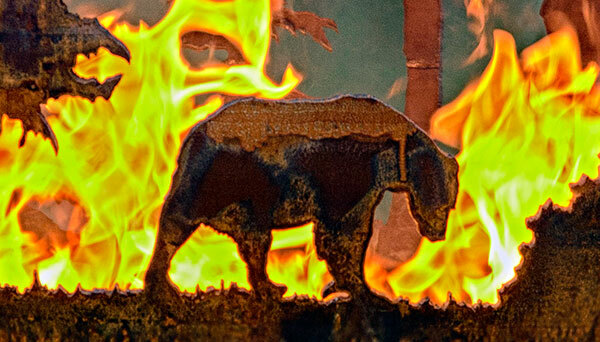 Although our steel fire pits don’t burn hot enough to create a fire on contact with your wooden surface, you should still protect your surface. 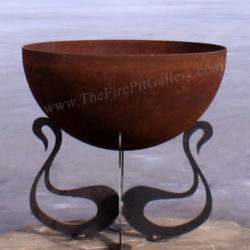 There are metal plates that are designed specifically to be a base for fire bowls and pits that you might want to consider. Many of them, however, are not the most attractive options. Another option is the use of pavers and decorative stones. These elements can be arranged nicely to create an attractive area for your fire pit. Create a base for your fire pit with the pavers or stones and securely place your fire pit on top. This way, your fire pit and your wooden deck don’t even come in contact. Certain cities also have ordinances and regulations when it comes to fire pits and specific instructions on where they can be placed. For example, there may be a certain amount of distance needed between a fire pit and your home. If your patio or deck is connected right to your house, you may not be allowed to have your fire pit there. Be sure to check the regulations to make sure your fire pit is placed in an appropriate location. Take a look at our fire spheres and bowls and comment below with which one you love. We’d also love to hear from you on our social media channels.